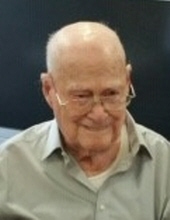 Services for William Leroy Bledsoe, 107, of Garland, Texas will be held at 10:30 am Monday, February 4, 2019 at Scoggins Funeral Home. Burial will follow in the Van Alstyne Cemetery. The family will receive friends Sunday, February 3, 2019 from 2:00 to 4:00 pm at the funeral home. William passed away Thursday, January 31, 2019 at Abba Care Assisted Living in Garland, Texas. William was born December 22, 1911 in Van Alstyne to Thomas and Emma Maude Hanson Bledsoe. He married Lois Hunter February 1, 1933 in Durant, Oklahoma; they were married for 76 years. She passed away in 2009. He was a graduate of Van Alstyne High School in 1930 and retired from Dallas Power and Light. He is survived by his son: Bill Bledsoe and wife Anita. Daughters: Martha Sanford and Ninna Sutherland. 11 Grandchildren: 35 Great-Grandchildren and 15 Great- Great-Grandchildren. To send flowers or a remembrance gift to the family of William Leroy Bledsoe, please visit our Tribute Store. "Email Address" would like to share the life celebration of William Leroy Bledsoe. Click on the "link" to go to share a favorite memory or leave a condolence message for the family.